Sign-up using the form or call us at (714) 638-4852 to make your appointment today! 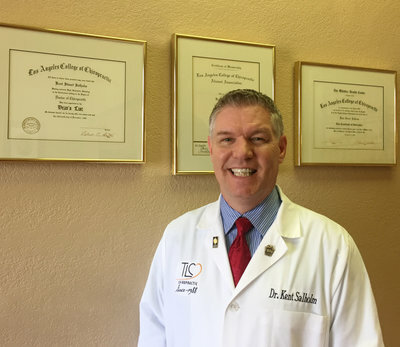 TLC Chiropractic, established by Dr. Kent Salholm in January 1988, specializes in treating all forms of personal injuries including auto accidents, motorcycle accidents, slip and falls, as well as sport injuries, and repetitive trauma. At TLC you will find the friendliest Doctors and Staff who offer genuine heartfelt concern for your health. Patients love our personal care! We treat our patients as part of the TLC family, and take pride in our sincerity and thoroughness, as we take time to listen to our patients and properly assess each patient’s own personal and individual needs, and then are passionate about getting our patients well fast. By taking the best of chiropractic, physiotherapy and rehabilitation, Dr. Kent and our associate doctors, Dr. Boyd and Dr. Brandon offer their advanced skills and expertise to focus on getting outstanding results treating neck and lower back pain, knee pain, headaches, pain radiating down the arms and legs. With over 30 years of chiropractic experience, our doctors work hard to achieve rapid and lasting results with a minimum amount of treatment. We treat everyone from youth athletes to professional athletes, as well as the weekend warrior. We provide care for patients of every age, from child to senior, with care being tailored to the special needs of each age and individual. Dr. Kent is also a well-respected trusted Medical-Legal QME examiner for more than 25 years, and has been providing expert second opinions and disability rating for injury in multiple locations throughout Southern California. We are a PPO provider and we accept most insurances including but not limited to: Aetna, Blue Cross, Blue Shield, Cigna, Health Net, ILWU, CalPers, Landmark, ChiroMetrics, Kaiser, ASHP and many others. TLC Chiropractic is located in the heart of Garden Grove on the corner of Euclid Street and Lampson. Our Location conveniently services the Orange County area including: Garden Grove, Anaheim, Santa Ana, Orange, Westminster, Fountain Valley, and Huntington Beach, and all of Orange County and Southern California. Feel free to view our raving 5 star review on YELP, and check our blog at DrKentSalholmBlog.com! We welcome you to our website and to our practice! Please feel free to contact our office with any questions and/or to schedule an appointment! "I really liked how Dr. Kent really listened to me. He gave a complete exam, told me what was wrong with me in terms I could understand, and answered all of my questions. Then he fixed my problem in only 2 treatments. That was all that was needed."